Researcher to share her unique connection to dementia at upcoming Victoria breakfast event | Alzheimer Society of B.C. Guest speaker Tomiko Yoneda, a PhD candidate in the Department of Psychology at UVic and an Alzheimer Society Research Program fellow, will share insight into her dementia research – and the unique volunteer background that led to her work – at Victoria’s Breakfast to Remember, presented by Trillium Boutique Senior Living. The event, a breakfast in support of the Alzheimer Society of B.C., is set for 7 – 9 a.m. on Tuesday, February 26 at Victoria’s Fairmont Empress. Tomiko is a former Alzheimer Society of B.C. 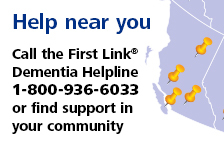 First Link® Dementia Helpline volunteer whose volunteer experiences in support of people affected by dementia set the course for her research focus and career aspirations. Tomiko’s volunteer experiences at Oak Bay Lodge and the Alzheimer Society, in conjunction with the fact that a cure for dementia has not yet been identified, has inspired her to investigate risk factors and early indicators of dementia and cognitive decline. She draws on her unique background to inform her research examining the role of personality change, blood pressure variability and physical activity as factors that may be related to the dementia process– a perspective she’ll share with guests at the event. Mandy Farmer, president and CEO of Accent Inns and founder of Hotel Zed, will join Tomiko as the keynote speaker at Victoria’s sixth iteration of Breakfast to Remember, presented by Trillium Boutique Senior Living. The event is an opportunity for community leaders across all sectors to take a leading role in creating change for people affected by dementia. Funds raised at the event will be used for dementia education, support services and research, as well as breaking the stigma of dementia. Full details, including ticket sales, available here.